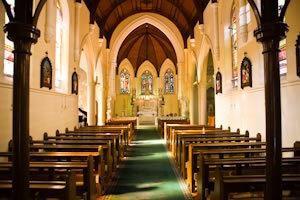 Sydney is blessed with a large number of beautiful churches, just perfect for your wedding. Aside from the obvious religious beauty of a church, there's something very classical and timeless about a wedding ceremony in a church from a photography point of view: stained glass windows, old sandstone, long lines of pews, high ceilings, spires and interesting light. We detail below a number of Sydney churches, including information like the church website, suburb, best feature, and sample pictures. An iconic building that dominates the Manly skyline, St Patrick's is a wonderful wedding location with old classic style and first class surrounds. The Cerretti Chapel itself is stunning inside with white, red, and gold colours, making it a very special venue. 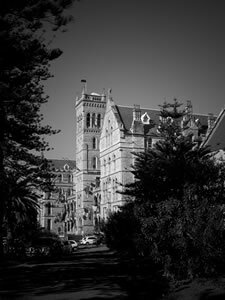 The exterior is very impressive, all stone and with a high tower that's visible from all over Manly. To top it, Nicole Kidman was married here so what more can you say?! 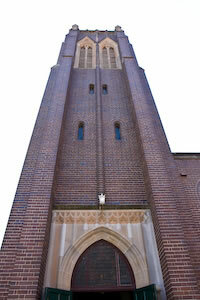 St Mark's Anglican Church in Darling Point is a stunning example of architecture and old world beauty. Built in 1852 the church has all the classic features you would expect from a building of it's age, with stained glass windows, beautiful sandstone, and a high reaching spire. Inside is moderately spacious, not huge, but certainly ample for a large wedding. There is a balcony area that is usually open for some photos from above as the bride enters (the classic Princess Diana shot). Simply a beautiful church and highly recommended! 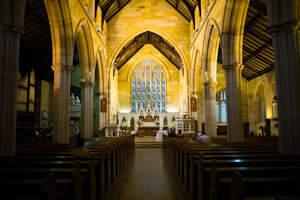 Churches really don't come any grander in Sydney than St Mary's Cathedral. 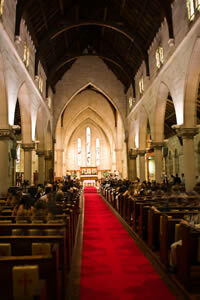 Located right in the heart of Sydney CBD, this English style gothic church was well known around the world even before the Pope's visit in 2008. As the photo shows, St Mary's Cathedral is a stunning example of all that is beautiful about an old style church: stone, high spires, arched doorways, stained glass windows, gargoyles, buttresses, statues, and massive front steps....and this is just the exterior! Inside St Mary's is equally sublime with the long row of pews leading to the High Altar. The interior is bathed in beautiful soft light every afternoon. There is also the Lady Chapel for smaller weddings All in all St Mary's is a stunning church to be married in! Booking forms & other information can be found on the website. 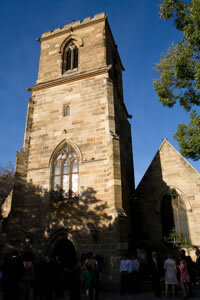 St Philip's Anglican Church at 3 York Street lays claim as the oldest parish in Australia, dating from 1788. The current church was built in 1856 and is a stunning example of a classic stone church with high arching columns, a long aisle, and beautiful stained glass windows. There is ample room outdoors for photos and mingling after the ceremony, plus you can even arrange for bell ringers to sound the bells! The location in the heart of the CBD is ideal for the many city based reception venues. The architecture is very similar to St Mark's in Darling Point and St Thomas' in North Sydney that were built in a similar period. Very highly recommended! The Chapel at Shore High School in North Sydney is a place steeped in history. 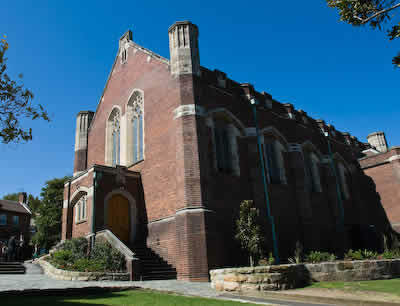 Built in 1915 in recognition of the school's 25th anniversary Shore Chapel is situated right in the heart of the school which itself is in a prominent position overlooking the Sydney city skyline. Inside is somewhat dark but this adds a certain sense of occasion to the wedding ceremony and the stained glass windows, large ceremonial flags, and long narrow aspect of this chapel is quite beautiful. 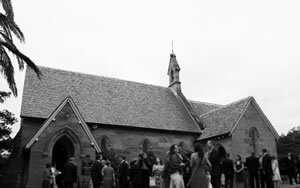 Outside the church is made from classic Sydney sandstone, and the grounds & gardens are great for mingling and photos. Location is exceptional as you're only a short trip to Lavender Bay, Milson's Point, Luna Park or other Sydney city locations. St Thomas' is located right in the heart of North Sydney and this makes it an ideal location close to Sydney city and also the North Shore. 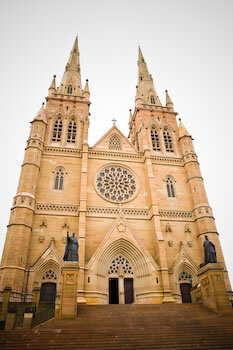 The exterior is beautiful sandstone with tall spires and a very large entrance area. The inside is stunning with light coloured sand stone, dark wooden pews, and red carpet all combining to give the church a very classic old world feel. St Thomas' is very spacious with seating for a large number of wedding guests, and the aisle is one of longest in the southern hemisphere! Tthere is a narrow balcony for a high and wide shot of the church. The Revd. Richard James is a wonderful celebrant and makes each wedding very special. A wonderful church, very highly recommended. 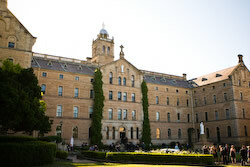 St Joseph's College is a stunning location for those old boys keen to hold their wedding ceremony at the school chapel. The college buildings and chapel are well known for the beautiful architecture and the main building that houses the chapel (see photo right) is simply magnificent. The chapel itself is large and has an upstairs loft area. Inside is light and the curved structure above the altar makes a wonderful frame for the ceremony. Highly recommended. 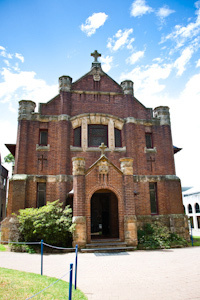 Mary MacKillop Chapel was built in 1913 and is located on Mount Street in North Sydney. A great location and the chapel is beautiful on the outside with tall spires and lovely stone work. The oak trees on Mount Street make for a beautiful green frame as well. The interior is well presented and there is a loft area. The chapel is a of medium size with seating for approx 150 max. 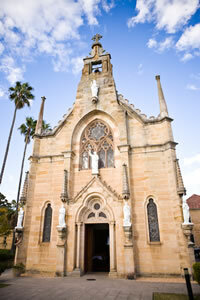 With Mary recently accepted by the Catholic Church as Australia's first saint you can imagine this beautiful church will only become more popular! 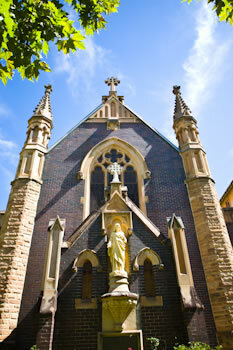 St Ignatius' College or Riverview has a beautiful chapel and it is even air conditioned! Great for summer weddings when the heat can be oppressive. The college chapel is built from mainly red brick and the exterior still has a lovely old world charm. The inside is quite modern with the altar area mainly white in colour. A medium sized venue it would sit approx 80-120 people, and there is an upstairs area as well. Right in the heart of the city this old church is beautiful from the outside with sandstone and a high tower, but inside it is quite stunning, especially when lit with candles. Plenty of space outside for family photos and general mingling before or after the ceremony, just difficult parking on Cleveland St. A perfect choice for a Greek Orthodox wedding in the heart of Sydney city. 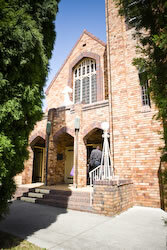 The Holy Name of Mary church in Hunters Hill is a beautiful church. It was established in the early 1850's and was built on plans of a church in Lyon in the south-east of France. So you can see the spires and look of the church is very different to a lot of Sydney churches. The interior is spacious with seating for a large wedding. The marble altar and general finishing is quite stunning. However, the aisle is very narrow so you won't want to wear a super puffy dress down this one! Great space outside at the front of the church for group photos and there's also plenty of parking on the street. Highly recommended. Our Lady Star of the Sea is a unique looking church with beautiful light and a simple yet classic exterior. The altar area has a very interesting curved back wall and the southern cross with stained glass. In the afternoon the natural sunlight on the western makes for a bright ceremony venue with rich colours. The upstairs loft is a great location for an overview of the ceremony. The church is medium size, good for approx 150 guests. Very handy to Watson's Bay and other great photo locations in the area such as Macquarie Lighthouse and Neilsen Park. 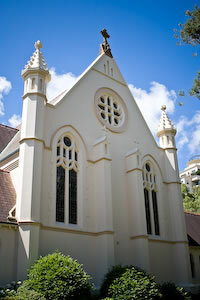 The Chapel at St Vincent's College in Potts Point is a lovely wedding venue. It is an old style chapel with a high ceiling and lovely interior features. There is a loft area for an aerial view and also an outdoor area large enough for mingling and group shots. Set on the Corso in Manly, this church does look somewhat plain from the outside, but the interior is surprisingly spacious and filled with colour and light. 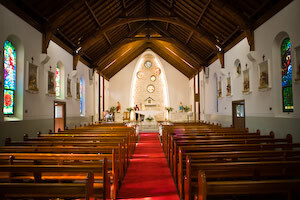 Unlike some churches that can be crowded St Matthew's has plenty of room for guests and the bridal party. Not many photo opportunities outside the church buy plenty to be had around Manly itself. Watch for tourists snapping photos of you as you leave! Located right in the centre of Paddington this church has some great features and wonderful style. 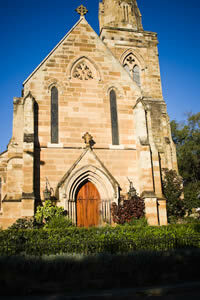 The sandstone exterior, beautifully arched doorways, and stained glass windows make this a lovely place to be married. Spacious inside, with an interested cross layout, there would be room for even a very large wedding. It even has good access from Oxford St or a back laneway, and some limited, but very useful, on site parking. The Chapel at Monte Sant Angelo Mercy College in North Sydney is simply stunning. The chapel interior is open and coloured in white and cream tones, with beautifully classic religious detail, stained glass windows, and more. The upstairs organ loft area is a good place for a high angle on the ceremony. There is plenty of seating and the beautiful grounds around the chapel add to the overall appeal of Monte Sant Angelo, making it a very special place to be married. You can feel the history of this place and for those whose parents also attended the high school here it would be a very lovely continuity of time and family to have your wedding ceremony here. 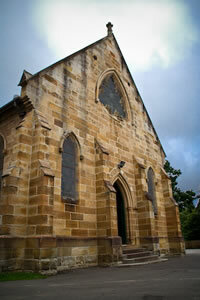 St Andrew's is a very old church situated on Raglan St in Manly, "just up the hill". It was built in 1890, so has the beautiful stone of that time, but the altar area and interior has been fairly recently updated to look slightly more modern. A good spot for family shots is around the corner against the side of the church, or simply right out the front. Manly Beach is literally a couple of blocks away so great photo locations are close at hand. The Minister Rev Derek Bullen is a very nice person with a great character and a relaxed and friendly style. Right in the suburban heart of Mosman the Uniting Church is a red brick building with dark wood interior and good natural light. While it doesnt have the old world style of less modern churches, the inside of the church is quite lovely with stained glass windows. 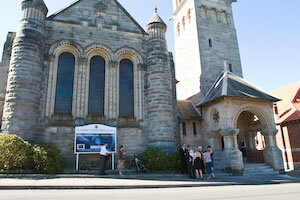 It has a capacity for approx 100 guests, with a good area at the front of the church for mingling etc afterwards. This church has a very spacious interior and extensive grounds around the church. The tall spire is distinctive and impressive and the beautiful sandstone of the old / back half of the church makes a great background for photos. The minister is often on site at a nearby house, and is very nice to deal with. 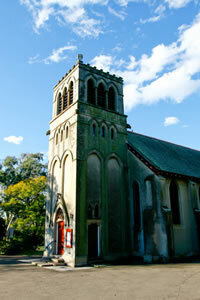 A classic looking Anglican church near the Gap and Watson's Bay. An old church with great sandstone build and beautiful stained glass. It's small inside with seating for only approx 70 people. There is a balcony area but again this is quite small. A wonderful choice if you have a smaller number of guests as the grounds and location near Watson's Bay is ideal. Oak Hill College has some beautiful grounds and the Chapel is also very lovely. There is plenty of colour and light and the upstairs balcony provides a great spot for a wide shot of the church. St Martha's in Strathfield has some interesting colour of the main altar and beautiful old stone of the outer buildings. There is great afternoon light into the church, and it has an upstairs balcony area although it's usually closed.